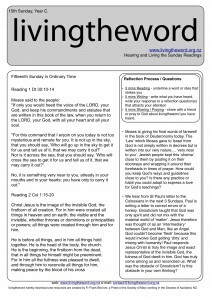 3rd Sunday Lent Yr C – ‘waiting for fruit’? The Corinthian community was becoming comfortable. They assumed that receiving Baptism and celebrating Eucharist was all one needed to be ʻsavedʼ. St Paul reminds them of the dangers of ʻpresuming salvationʼ. Our Hebrew ancestors did this and they ʻwere struck down in the desertʼ. This is a warning. We need to continually try to co- operate with God. Are you feeling ʻcomfortableʼ in your faith? What lifestyle choice or action could you make to show a radical following of Jesus? 2nd Sunday Advent – Prepare! 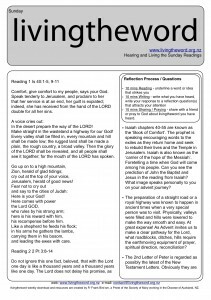 Reflection Question 3: They say of John the baptist: He is admired from a distance but watch out when you get close! Repent! is his cry and message. 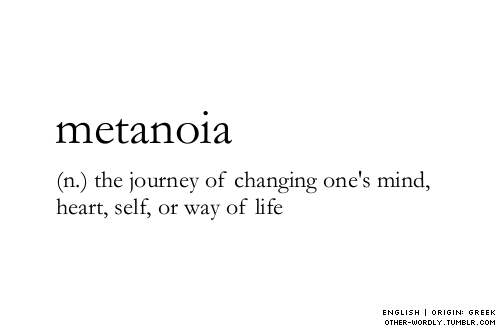 In the original Greek the word is Metanoia. Meta – change. Noia – mind / thinking. It is often linked in scriptures to both personal and communal conversion to bring about a social reconstruction of society. Everything is to be made ‘right’ ‘repaired’ ‘turned to God’s way’. Identify something you want to change personally and communally – producing ‘good fruit’. Write this in a place you will often notice during Advent. Advent Story: Hands Up! Anthony De Mello. Some years ago a great retreat preacher came into a crowded room of people who had traveled great distances to be on retreat. The preacher came to a microphone and asked: Hands up those who want to go to heaven? Immediately all hands waved in the air. The preacher then asked: Hands up those who want to go now? No-one put their hand up. He said ‘you might like to spend the day thinking about why you are not ready now. And with stunned silence he left the room.